Coupons can save you big money at the market if you approach them strategically. Buy two copies of the Sunday paper, and clip coupons for every product your family uses regularly. Sign up for the loyalty program at your favorite market, and you can build rewards points and receive opportunities for extra savings in the mail. Often, grocers double the value of coupons on certain days of the week, so try to shop on that day. You can also sign up for free coupon-aggregating websites like Savings Angel, for deals that aren’t in the paper. Establish a filing system so your clippings don’t expire before you use them, and don’t be afraid to use discount grocers or buy generic. Often, you won’t even notice the difference. If it seems expensive to smoke and drink, that’s because it is. The average cost of a pack of cigarettes is a whopping $6 – if you’re smoking a pack a day, do the math. If a drink or two is your vice of choice, foregoing even a $20 bar tab every Friday and Saturday night adds up to far beyond that $1,000 goal. If you can’t stomach giving up your guilty pleasures completely, try cutting back. Every little bit counts – toward both your savings and your health. Supposing you have a $100,000, 30-year fixed mortgage at 5%. Your monthly payment is $540. If you send in an extra $75 per month, you can cut the length of that mortgage down to 18 years and save more than $25,000 in interest over the life of the loan. Lots of banks regularly send homeowners applications for a bi-weekly payment plan, but you can reach the same goal without the associated fees. Just make sure you’re not subject to a prepayment penalty before you submit that first extra payment. The typical American carries $8,000 in credit card debt and pays an average of 14% in credit card interest. Over the course of one year, that means you’re sending well over $1,000 of your hard-earned money right out the window. To help drum up the money to pay off those balances, try cutting back on your monthly bills. Renegotiate your cell-phone commitment and bundle your cable and Internet. Buy only items you need, not items you simply want. Then redirect all your savings toward that debt. Once your balances are paid off, you can go back to living your normal lifestyle – although hopefully these cost-cutting measures can become a permanent part of it. Saving money calls for more than a change in habits – it requires a change in mindset. Think constantly of ways to cut costs, from small-scale to large. Turn off the lights in rooms you’re not in. Unplug appliances when they’re not in use. Conserve water. Adjust your thermostat by just three degrees in either direction to save up to 20% on your energy bill. By capitalizing on all these opportunities to save, you can hit that $1,000 threshold in no time. 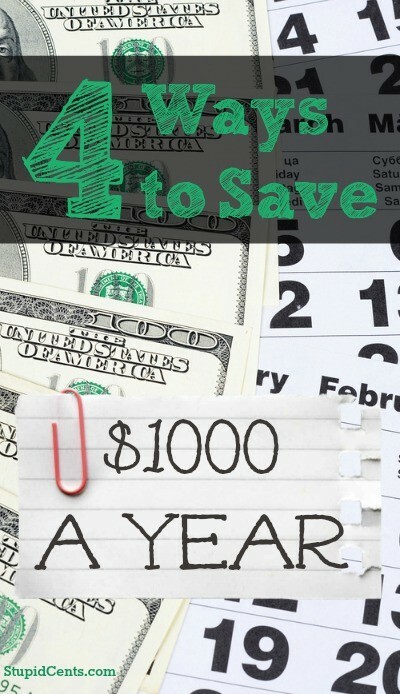 What other ways can you think of to save $1,000 per year? David Bakke is an author and writer for Money Crashers, a personal finance resource that shares insights for saving more money, getting on the right track financially, and building wealth. I like the idea of living an “interest-free” (debt free) lifestyle. The money you would have spent on interest will serve you and your family much better in an IRA, 401k, or other investment! Find cheaper alternatives to the things you’re already spending money on. This is easy to do at the grocery store — experiment with cheaper brands until you find one you like just as well as the pricy one you’re already buying. We decided to drop Netflix when we realized we could find a ton of TV shows and movies on YouTube and other streaming video sites — $120 a year that can be shifted elsewhere! If you live in an apartment, share your bills with your neighbors. For example, I split my internet bill with my next door neighbor and give him access to my password. My $70 monthly internet bill gets slashed to $35! I absolutely agree that if you want to consistently save money, it should be a mindset not just something that you do when the situation calls it. Practices that are constantly followed will turn into habits that can change your personality for the good and for your financial future.